Long ago, man fought dragons to gain dominance of the continent of Elibe. Eventually, man emerged victorious and spread their influence across the land. Thousands of years later, the Kingdoms of Etruria and Bern co-exist with a tender balance. However that balance suddenly deteriorates, when Bern, under the rule of King Zephiel, starts invading the neighbouring territories. Roy, the heir to the Lycian nation of Pherae, gathers an army, in place of his ill father, to oppose Bern’s invasion. After the complexity of the previous two Fire Emblem titles, Binding Blade returned to the simple gameplay of Mystery of the Emblem in the series’s first handheld title. Although technically a step backwards, the core gameplay was still very enjoyable and more relaxed- perfect for handheld play. Originally it was looking like this game would be Fire Emblem‘s debut in the West, with the game’s protagonist, Roy, appearing in Super Smash Bros. to market the game in Japan. However an English release sadly never occurred. As well as sharing similar gameplay, the storyline was also quite reminiscent of Mystery of the Emblem. This time, the continent of Elibe is invaded by the militant Kingdom of Bern who wishes to conquer the world using the power of dragons. Roy, the main hero of the game, journeys to unite the fallen League of Lycia and the Kingdom of Etruria, both of which have been tied down by the war, to gather a force powerful enough to prevent Bern’s intentions. The story might have been pretty simple, but it was accessible and full of hidden depth. 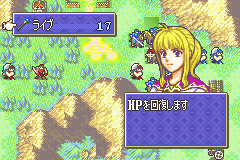 Clarine, about to heal a wounded ally. Compared to prior games, the graphics were more bright and colourful, and the battle animations more over-the-top, especially during critical hits. The face designs were much improved, sporting a more anime-styled look. Newly introduced support conversations between certain character pairs, which can be initiated in the middle of a chapter, greatly increased character development. An auto-save mechanism was implemented, which recorded chapter progress in (almost) real-time. There was also a short and basic tutorial for Fire Emblem beginners. Many features that were introduced for Genealogy of the Holy War and Thracia 776 were removed. Gone are Skills, the Fatigue system and more. Many of the classes are also more similar to the ones used in Mystery of the Emblem. A few features managed to stay on though, such as the weapon triangle, sidequest chapters, Fog of War and rescuing. The magic trinity was also retained, although Fire, Thunder and Wind magic were absorbed into the Anima magic category. The support system from previous titles was greatly enhanced. Now there are three levels of supports and wider support options for characters. Each characters possesses an elemental Affinity, with the combination of Affinities determining the type of support bonus. Support relations can be improved by having units wait next to one another for a number of turns. Once a support is achieved, character pairs can converse on the battlefield to finalise the support, with an unique conversation existing for each level of support. During chapters, you can choose to suspend the game and continue your progress from the suspended save data. However if you just switch off the game (for whatever reason), the game automatically suspends the game for you. Very handy if your batteries happen to run out when you’re in a middle of a chapter, or if you need to get off the game ASAP. 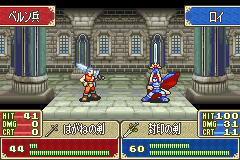 Roy fighting with the Binding Blade. After completing the game, players could challenge the Trial maps with their endgame parties. These Trial maps are one-off maps that have no real connection to the story. They don’t award experience points nor do they save your progress at the end. However they are an entertaining diversion nonetheless, featuring varied victory conditions that the main story lacked. More maps could be unlocked by beating the game on Hard mode and with the best Ending. There were also some limited edition maps that could be obtained from promotional competitions. Previous games had hidden modes or settings to adjust the difficulty. This game finally introduced a proper harder difficulty setting for seasoned fans, which featured more and stronger enemies. The move to a handheld system made it more convenient for a multiplayer mode to be implemented. However, compared to its sister series Advance Wars, the multiplayer mode in this game is much more basic. In the Link Arena, players form groups of five characters, raised in the main story, to challenge other players or the computer. Unlike in the main story, there is no movement of characters and players can only attack with one character during their turn.